NATO leaders plan to turn their attention to the conflict in Afghanistan, on the second day of a summit so far dominated by demands from President Donald Trump. Trump on Wednesday urged Nato allies to commit 4% of their annual output (GDP) to military spending. He also singled out Germany for criticism over its defense spending. Nato leaders are hoping for a more conciliatory tone on Thursday before Trump leaves for the UK. But in a late-night tweet from Brussels, the US president reiterated his criticism. 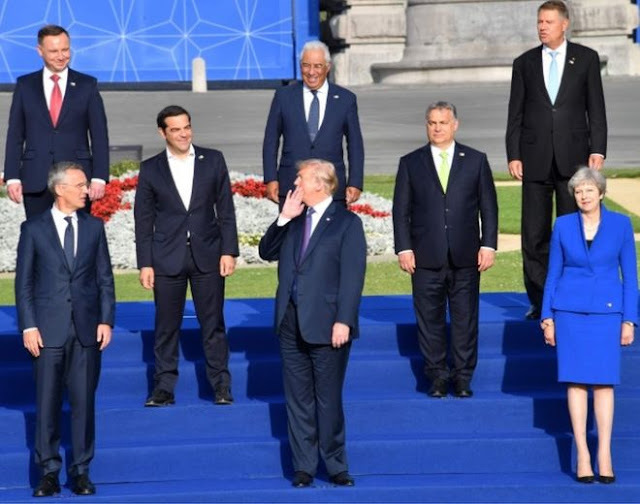 "Billions of additional dollars are being spent by NATO countries since my visit last year, at my request, but it isn't nearly enough," he declared. He earlier accused Germany of being held prisoner to imported energy Russian energy, claiming it is "totally controlled" by Moscow. EU figures suggest Russia is responsible for between 50% and 75% of Germany's gas imports, but gas makes up less than 20% of Germany's energy mix for power production. What's the plan for Afghanistan? Afghanistan's President Ashraf Ghani will be present for the second day of talks, and Nato's Secretary-General Jens Stoltenberg hopes the bloc will agree to fund Afghan security forces until 2024. Britain's Prime Minister Theresa May has already confirmed that the UK will send 440 more troops to serve in non-combat roles in Afghanistan. The US also committed an extra 3,000 troops to support Afghan forces in September 2017 - bringing its total to 15,000. US officials have said Washington is planning a strategic review, a year after Trump agreed to remain involved in the 17-year conflict. Nato leaders will discuss the alliance's ties with Georgia and Ukraine. Both countries want to join Nato, but their bids are not expected to make progress. That is because Russia has engaged in territorial incursions into both states, and Nato rules prevent countries with a land conflict from joining. By contrast, a ceremony will be held for Macedonia after it was invited to begin accession talks on Wednesday. Where does Trump go next? When the Brussels summit winds up, Trump will arrive in the UK on Thursday for a two-day working visit. Trump is the 12th sitting US president to make such a trip, and will spend time with the Queen and prime minister before flying to Scotland to spend the weekend at his golf resort. Thousands of people are expected to protest against his visit across the UK. Trump is due to hold his first summit with Vladimir Putin, in Helsinki, on 16 July. He shocked some by quipping that the Nato gathering might prove tougher than next Monday's summit with Putin.